Our Intel NUC Mini Computers and Servers, Compute Card & Dock, and Compute Stick are proof that big things can come in small packages. Businesses strive to maintain lean IT environments, and our NUC computers help by restoring the efficiency lost through running outdated hardware to boost the success of any business. 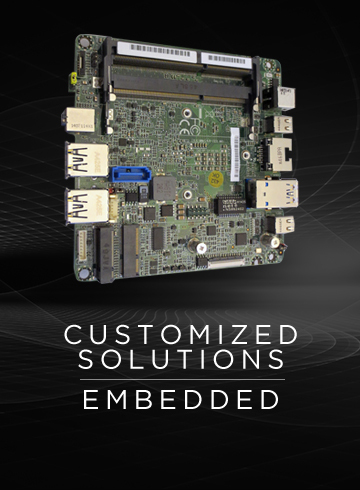 Our hardware solutions place the customized computing power you need into an exceptionally small footprint. This harmony of capacity and design makes it easy to deploy and maintain our technology for many applications. EWC NUC (UCFF) Ultra Compact Form Factor computers may look as if they belong at a personal computer station. While our computers could be deployed this way, they can also serve as a solution for broader computing needs in nearly any space or environment. For example, our models can be securely mounted for in-vehicle applications, operate digital signage or content, and support virtual machine environments that use embedded systems, to name a few. Regardless of why they deploy an Intel NUC kit, a common need of our clients is Power-Over-Ethernet (POE) I/O capable devices. Our exclusive “Network Powered” POE NUC computing solutions deliver the following benefits, among a growing list of others: They eliminate costly AC electrical wiring for computers or free existing receptacles, reduce electrical installation and maintenance, optimize energy consumption, centralize network/power management with an Uninterruptible Power Supply (built in UPS via UPOE Switch in the data closet), and increase IT security by combining dedicated ethernet + power to all computers within your business office via a single, securable, CAT-based network cable connection and a second gigabit POE NIC for separation of internal and external networks. Contact us to learn more. In addition to NUC computers, we offer businesses a complete supply and service solution, including a complete support pipeline, a dedicated rep, and a one-stop shop for all mini computer hardware and nearly any peripherals, such as: Displays, Cables, Adapters, Keyboards, Mice and any Office Electronics. Also rely on our team for EWC in-house tested, custom NUC upgrades /add-ons /add-ins and related replacement parts. We know you need a supplier whose NUC computers reliably support your business around the clock. This is why we take on all risks associated with the expected business uptime of our solutions, virtually ensuring no interruption throughout — and, in most cases, well beyond — the lifecycle of our systems and solutions. No matter how good an IT solution is on paper, its true value is revealed by putting it into action. We can provide you with a fully operational demo version in a little as two days, which you can fully test real-time in your environment for 2 to 4 weeks to see how your custom Intel NUC kit meets your needs. Our demos are free, with no obligation to buy, and are usually purchased for one application or another, given their size and power. See the benefits you would get, risk-free. To request a demo, or for assistance with purchasing or selecting hardware, please contact us. We look forward to helping you harness the power of EWC NUC computers for business.